OC Politics Blog | Prominent coastal environmentalists endorse Daigle for the 74th A.D.
Newport Beach, Calif. – Two of the most constructive forces for environmental sensitivity in Orange County’s history and who have spent years on the front line of successful efforts to retain and improve Orange County’s coastal resources today announced their endorsement of Newport Beach City Councilwoman Leslie Daigle, a candidate for the new Assembly District 74. It includes the coastal cities of Newport Beach, Huntington Beach and Laguna Beach. Jean Watt, Orange County’s iconic coastal environmentalist and Garry Brown, President of Coastkeeper of Orange County are supporting Daigle’s candidacy. Jean Watt is the founder of Stop Polluting Our Newport, The Newport Conservancy, and Friends of OC’s Harbors and Beaches and Parks. She served two terms on the Newport Beach City Council. Her influence is far reaching and she is widely called upon to provide input on coastal issues. Jean Watt graduated from Stanford University where she studied nursing. Her late husband, James, was a physician. Jean’s family founded one of California’s oldest law firm Hahn & Hahn, which is located in Pasadena. Garry Brown is a determined and effective leader in the preservation of Orange County water bodies and restoring them to healthy, fully functioning systems that will protect recreational uses and aquatic life. He is a native of Orange County and a graduate of the University of Redlands. Garry’s path crossed with Leslie when she functioned as the Council’s lead advocate for the completion of the Upper Newport Bay Ecological Restoration project and the initiation of the dredging of lower Newport Bay including the Rhine Channel. Garry has spent many years on ecological issues connected to Newport Bay. “Leslie recognized the environmental, economic and recreational value of Newport Bay and obtained the resources necessary to implement regional projects involving longstanding community goals and priorities,” said Brown. Daigle is in her second term on the Newport Beach City Council. 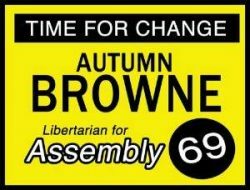 She is running for the wide open Assembly District #74. Around 80% of the new district is now represented by Assemblyman Don Wagner and Jim Silva. Wagner is running in a different district and Silva is termed out. The quiet but significant reforms of citizen initiatives resulted in newly drawn legislative districts with communities of common interest. More than half the residents in the new district live along the coast. Coastal and bay waters are a high environmental priority because they define cities and are a source of enjoyment, recreation and important economic activity.